The head of Japanese technology company SoftBank Group Corp. said Wednesday it has reached an agreement to sell its stake in Indian e-commerce company Flipkart to Walmart. Son did say he was doubling his initial investment with the sale. The agreement was reached overnight, and an official announcement is coming soon, he said. Son made the comments on Flipkart casually during his earnings presentation. Later, when he was told no announcement had been made, he told reporters: "Oops. I already said it." Quarterly sales totaled 2.35 trillion yen ($21 billion), up 1 percent from 2.32 trillion yen. After an aggressive overseas acquisition campaign, SoftBank also plans to give up some of its stake in U.S. wireless company Sprint, under a $26.5 billion merger deal that will combine it with T-Mobile. That deal is awaiting U.S. regulatory approval. Online sales have exploded in India over the past couple years and Amazon has been fighting hard to catch up to Flipkart, which was founded in 2007 by two former Amazon employees, Sachin Bansal and Binny Bansal. They launched Flipkart from a humble apartment, initially as a bookstore delivery service. The two men are not related. Walmart has been expanding its online services in the U.S. to better compete with Amazon. The retailing giants are expanding that battle overseas. In China, where more than 700 million people are online, it has had a tough time competing with local players like Alibaba, another company partnering with SoftBank. Son said the merged entity will become a winner in the U.S. amid an ongoing move to the next wireless technology of 5G. Results have improved dramatically at previously money-losing Sprint. Sprint recently reported its best operating income in its company history spanning more than a century. 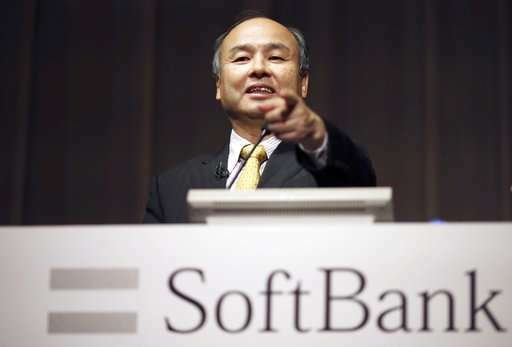 Son said much of SoftBank's recent profits result from investments of its Vision Fund, set up in 2016 to invest in innovative companies with money from Saudi Arabia and other investors, such as Apple. He stressed his fund was banking on future winners. That also illustrates a vision, he said, noting that most of the dozens of nuclear reactors in Japan are still offline after the 2011 nuclear disaster in Fukushima, northeastern Japan, because of beefed up safety standards and lingering public fears.